Rachel Farbiarz: Take Me With You opened last weekend and yesterday marked the first day of work on Making an Apology, a new piece Rachel will be creating here in the gallery. 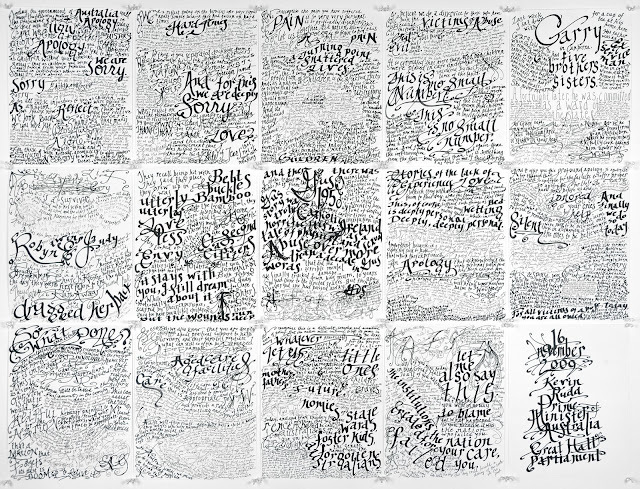 Making an Apology will be the third work in Rachel's Apology series, which includes the Apology to the Forgotten Australians and Former Child Migrants, and National Apology for Forced Adoptions, both on view at the gallery (and pictured below). Rachel first became interested in these formal speeches after hearing a clip of Prime Minister Kevin Rudd's Apology to the Forgotten Australians and Former Child Migrants on the radio in 2009. She says she "had never heard anything like Rudd's speech. His words were so raw; his tone so anguished. This was nothing like the political culture's parlance to which [she] was accustomed. It was specific, personal and remorseful. It seemed to allow not for error, but for sin; and to pine not just for improvement, but redemption." 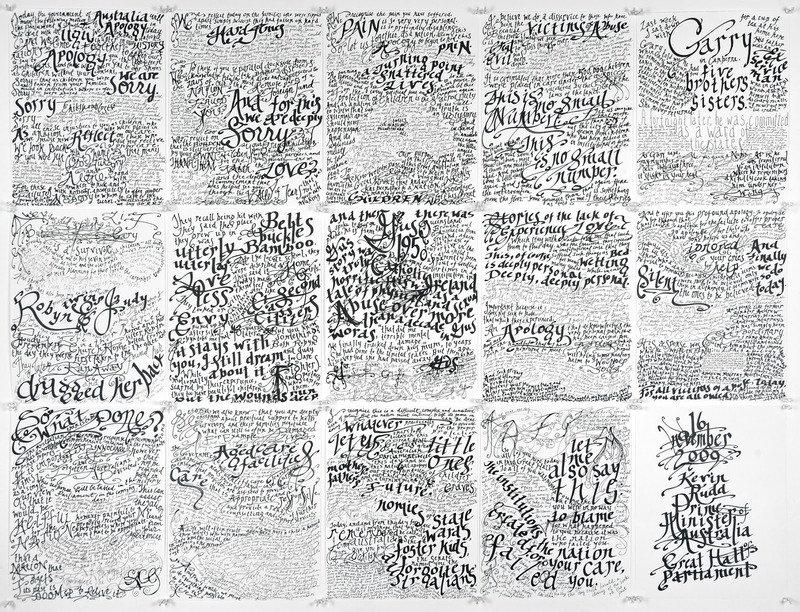 She created the text-based piece in what she characterized as a fever dream; passionately scribing each phrase, she aimed to create something worthy of the weight and beauty of the spoken sentiments. Similarly, when she learned of Prime Minister Julia Gillard's National Apology for Forced Adoptions, she felt compelled to honor, conserve and venerate the words of her official speech. For Making an Apology, Rachel will transcribe the speeches leading up to the formal apology to the indigenous peoples of Australia issued in 2008. Rachel will be working in the gallery several times over the next few weeks, check out the schedule below and keep an eye out on Facebook for additional dates // times! Although we hold these truths to be self-evident, that all men are created equal, far too often we fall short of our ideals. Rachel's Magna Carta is making history, and history in the making.